Hung Liu's "Mu Nu (Mother and Daughter)." Offerings, a recent exhibition at Mills College Art Museum, presented a number of huge installations by the college's ex-faculty member, Hung Liu, one of the first artists granted passage out of Communist China to pursue a career abroad. They conveyed the cultural in-betweenness that has characterized the artist's practice since she arrived in California in the mid 1980s. In terms of sheer scale, Liu's 1994 "Jiu Jin Shan (Old Gold Mountain)," which consists of 200,000 fortune cookies piled atop crossing railroad lines, is certainly one of the artist's grandest gestures. When divorced from her broader practice, however, it appeared disappointingly null in Offerings — like a moderately interesting statement overblown to spectacular proportions. Summoning Ghosts: The Art of Hung Liu, a retrospective of Liu's work now showing at the Oakland Museum of California, provides the context needed to appreciate the artist's aforementioned installations. Moreover, it is the better exhibition for the simple reason that Liu's paintings stand superior to her installation work. Indeed, they are truly humbling. With the exception of a few preliminary galleries devoted to Liu's early work, the exhibition consists almost entirely of one type of piece: a figurative painting on a large, shaped canvas, paired with a physical object or two that adds a complementary dimension to the painted scene. A steel cylinder evocative of artillery accompanies a painting of the Tiananmen Square catastrophe; a tea set rests on platforms jutting out from a painting of a Chinese family in a domestic setting. 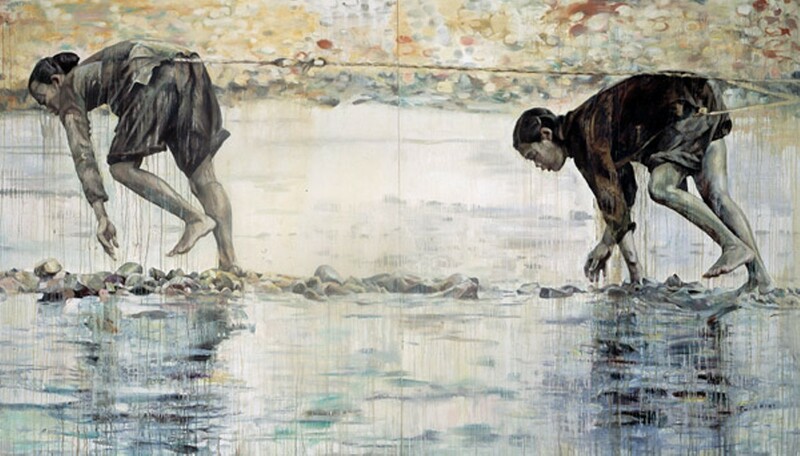 Liu typically sources her scenes from found photographs, which she then transposes onto canvas through a distinctive process of drippy brush strokes and washes, giving them a worn quality. Rendered thus, her subjects take on a materiality beyond paint smears on a flat surface: They become like ancient specimens petrified in amber. 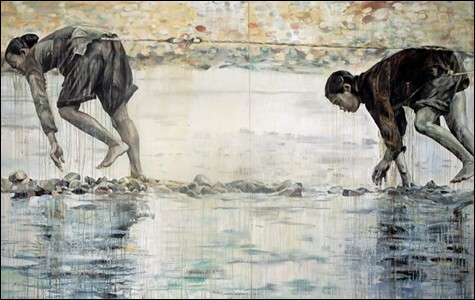 Liu gravitates toward images of the downtrodden and exploited: prostitutes working for the Chinese upper class, field laborers, a row of emaciated men sold into slave labor in Japan. Her paintings read as attempts to rescue these sufferers from the oblivion of history, exalting them without at all diminishing the hardness that characterized their lives. As Liu's mother neared the end of her days, the artist took to making daily one small painting depicting one of her mother's belongings or intimate objects. The day her mother died, Liu smeared a canvas with all colors, merging them into a thickly encrusted black. The day after was black, too, but with a faint ring of light appearing, and a procession of flickering mourning candles followed (the whole indelible series is on display in the exhibition). One gets the feeling that if Liu had more to go off of than found photographs, she would treat each of her subjects with just this degree of intense intimacy. Few artists convey such seemingly endless depth of compassion. Nothing could be further from null.